Our MTO approved curriculum, the “Brisa on Wheels” ( A Breeze on Wheels) program has been developed by two of Ontario’s leading road safety educators, Ben Estrada, hence the Spanish sounding program name, and Keith Black. An engaging and easy to follow program, Brisa on Wheels is the choice of 50+ driving schools across Ontario. This program is centred around a 240+ page full colour text/workbook combination that is supplied to each student to study, to take notes in and complete assignments and quizzes. 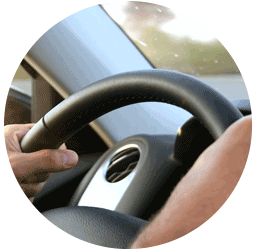 Accompanying the text are videos, Power Point slides, and magnetic whiteboard presentations, all aimed at generating discussion of various driving scenarios . Participation through discussion and questions is encouraged, as this BDE program focuses on the decisions which individuals must make to stay safe on the road. At Joe’s Driving Academy, we believe in teaching Proactive Driving techniques, how to use one’s eyes effectively to perceive hazards as they develop, how to make accurate judgements and decisions about vehicle positioning and speed to avoid dangerous situations, and finally how to control the driving environment and stay safe.